At the 2015 New York International Auto Show, Honda unveiled the 10th-generation Honda Civic Concept. 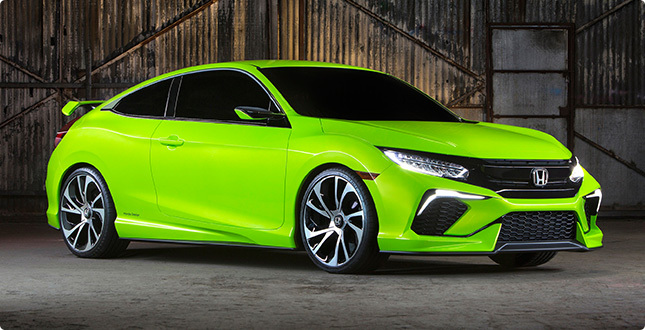 Launching this fall, the new Civic lineup will include the Civic Sedan, Coupe and Si models along with the return of the Civic hatchback, followed by the launch of a new Civic Type-R as the performance flagship of the Civic lineup. The new Civic also will be the first North American model to apply new VTEC® Turbo engines from the company’s Earth Dreams Technology™ powertrain series. Featuring a longer wheelbase and lower, wider stance, the new Civic emphasizes its aggressive personality and engaging experience behind the wheel. Its sporty and expressive face is highlighted by bright new LED headlights flanking the “Flying H” Honda grille which is supported by deeply sculpted lower air intakes. The 10th-generation Civic is based on a compact platform that targets benchmark levels of efficiency, dynamic performance, safety and production efficiency. Leveraging this new platform in conjunction with new Earth Dreams Technology™ powertrains – including a new 1.5-liter VTEC® Turbo engine with direct injection, a short-shifting 6-speed manual transmission, and a new, more sporty and efficient continuously variable transmission (CVT) – the Civic will target class-leading fuel economy ratings and fun-to-drive performance with near-luxury levels of cabin quietness and ride refinement. The new Civic will also focus on safety performance and will offer the Honda Sensing™ suite of advanced safety and driver-assistive technologies, including Lane Departure Warning, Forward Collision Warning, Multi-Angle Rear-view Camera, Adaptive Cruise Control and Honda LaneWatch™, along with Honda’s next-generation Advanced Compatibility Engineering™ (ACE™) body structure. As the best selling passenger vehicle in Canada for 17 years, the redesigned Civic is sure to be a hit and we can’t wait for its debut at Image Honda this fall. For more information about our outstanding Honda vehicle lineup, visit us at www.imagehonda.com or call us at (905) 561-4100. This entry was posted in Honda, Image Honda and tagged 1.5L VTEC Turbo engine, 2016 Civic, 2016 Civic Concept, 2016 Honda Civic, Adaptive Cruise Control and Honda LaneWatch™, Auto Blog, Car Blog, Civic, class-leading fuel economy, CVT, dealer blogs, dealership blogs, dealerships Hamilton, Earth Dreams Technoly, Forward Collision Warning, Hamilton Auto Blog, hamilton blogs, Hamilton Honda Dealer, Honda, honda blogs, Honda Civic Hamilton, Honda Image, Image Honda, Image Honda Hamilton, Lane Departure Warning, Multi-Angle Rear-view Camera, short-shifting 6-speed manual transmission by Hamilton Auto Blog. Bookmark the permalink.